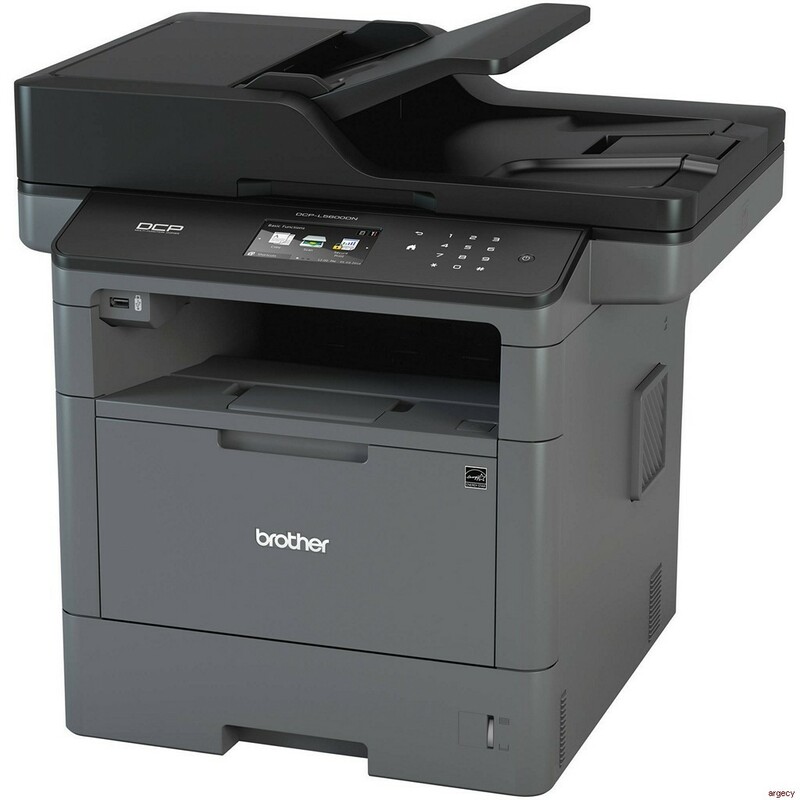 The Brother DCP-L5600DN monochrome laser multi-function copier is ideal for offices and small workgroups looking for reliable performance. Your team will appreciate print and copy speeds of up to 42ppm, and your budget will benefit from cost-efficient output due to a high-yield replacement toner cartridge. This multi-function copier offers flexible paper handling with a 250-sheet capacity paper tray, a 50-sheet capacity multi-purpose tray, and optional add-on trays for a total capacity up to 1,340 sheets. The 70-page capacity auto document feeder quickly scans two-sided multi-page documents to multiple destinations, and a legal-size document glass is ideal for copying and scanning bound materials. Advanced security features provide network user authentication and help protect against unauthorized access. Plus, directly print from and scan to popular business cloud services with the customizable color Touchscreen display. Advanced duplex capabilities. Automatic two-sided printing helps save paper. Plus, the 70-page capacity auto document feeder scans both sides of the page in a single-pass for two-sided monochrome scanning up to 56ipm. Cost-efficient output. Help lower your operating costs via a high-yield 8,000-page replacement toner cartridge. Built-in networking. Share the DCP-LhDN with multiple users on your network via its Gigabit Ethernet interface. Fast scanning with advanced features. Help increase your productivity with monochrome scanning up to 28ipm. Plus, support for multiple scan-to destinations such as E-mail, SSH Server (SFTP), USB, SharePoint, Cloud, Network Folder (CIFS), and more to easily adapt to your customized workflow. Flexible paper handling. Easily handle your large print jobs via an adjustable 250-sheet capacity paper tray and 50-sheet capacity multi-purpose tray. Additional optional paper trays are available in 250-sheet or 520-sheet capacities enabling users to configure the printer with multiple trays in a way that best meets their application requirements - up to 1,340-sheet total capacity. Walk-up printing and scanning. A USB Host is located on the front of the machine for printing files from or scanning files to your USB flash memory drive. Convenient mobile device printing and scanning. Print from your mobile device via: AirPrint, Google Cloud Print 2.0, Mopria, Brother iPrint&Scan and Cortado Workplace. Plus, wirelessly scan to your mobile device with the Brother iPrint&Scan app. Outstanding customer support. The Brother DCP-L5600DN offers a 1 year limited warranty with free phone support for the life of your product. The DCP-L5600DN will help enhance your workflows productivity with a print and copy speed up to 42 pages per minute. This high-performance multi-function copier produces professional reports, spreadsheets, correspondence, and other important business documents with crisp text and excellent graphics. Plus, it offers simultaneous operation (for example, printing and scanning at the same time) so that multiple workgroup members can use the machine at the same time without experiencing slow-downs. The DCP-L5600DN features fast monochrome scanning up to 28ipm1 to help maximize the productivity of your office. Plus, use the 70-page capacity auto document feeder to scan both sides in a single-pass for two-sided monochrome scanning up to 56ipm1. If you need to copy or scan bound materials, the DCP-L5600DN also offers a legal-size document glass. The DCP-L5600DN comes with a 250-sheet capacity paper tray that is adjustable for letter or legal size paper. A 50-sheet capacity multi-purpose tray is useful for printing envelopes (up to 10) and on alternative media types. Additional optional paper trays are available in 250-sheet or 520-sheet capacities, enabling users to configure the multi-function copier with multiple trays in a way that best meets their application requirement - up to 1,340 sheet total capacity. With easy menu navigation and the option of creating up to 48 customized shortcuts for frequently used functions, the large 3.7 color Touchscreen display simplifies even the most complicated tasks. Scan to or print from popular business cloud services directly from the Touchscreen display without using a computer. Supported services include EVERNOTE, DROPBOX, GOOGLE DRIVE, ONENOTE, and more (print and scan functionality varies by service)3. You can share this multi-function copier with others on your network via its Gigabit Ethernet interface. Plus, your workgroup members and office visitors will appreciate the convenience of printing wirelessly from a compatible Apple iOS, Android, Kindle Fire, or Windows Phone mobile device. Print via4: AirPrint, Google Cloud Print 2.0, Brother iPrint&Scan (free downloadable app), Cortado Workplace, and Mopria. Brother is At Your Side with a 1-year limited warranty and FREE phone support for the life of the product. Apple and AirPrint are registered trademarks of Apple Inc. in the U.S. and other countries. 2015 Google Inc. All rights reserved. Android, Google Drive, and Google Cloud Print are trademarks of Google Inc. Mopria is a trademark of Mopria Alliance, Inc. Cortado is a trademark of Cortado AG. Kindle Fire is a trademark of Amazon.com, Inc. or its affiliates. Active Directory, SharePoint, Windows Phone, OneNote, and OneDrive are trademarks of Microsoft Corporation in the United States and other countries. DROPBOX is a trademark of DROPBOX, Inc. EVERNOTE is a trademark of Evernote Corporation and used under a license. 6 Approximate yield of TN820 vs. TN850. Based on using respective toner cartridge yields in accordance with ISO/IEC 19752 (letter/A4). TN850 cartridge sold separately. For WIA, 1200x1200 resolution. Brother Scanner Utility enables to enhance up to 19200 x 19200 dpi. PaperPort 14SE supports Windows XP Home (SP3 or greater), XP Professional (SP3 or greater), XP Professional x64 Edition (SP2 or greater), Windows Vista (SP2 or greater), Windows 7, Windows 8 and Windows 8.1. For the latest driver updates, visit solutions.brother.com. <="" td=""> Approximate toner cartridge yield in accordance with ISO/IEC 19752 (letter/A4). Drum yield is approximately 30,000 pages based on 1 page per job and 50,000 pages based on 3 pages per job [letter/A4 simplex pages]. The number of pages may be affected due to a variety of factors including but not limited to media type and media size. For more information see www.brother.com/pageyield. Brother Cloud Apps Requires internet connection. For more details, visit www.connectprintshare.com. Scan Speed (maximum) Scan speed measured with all advanced features turned off using LTR size test documents at 200dpi.